Greetings snarky friends! Hope you are recovering from your holiday libations! So let's see what yuck craft supplies you've been hoarding...you know the stuff that's SOOOOOOOO fugly that you haven't yet dared to use it! Visit the SoSS BLOG for all the details on the challenge and be sure to show the sisters some crafty lovin!! 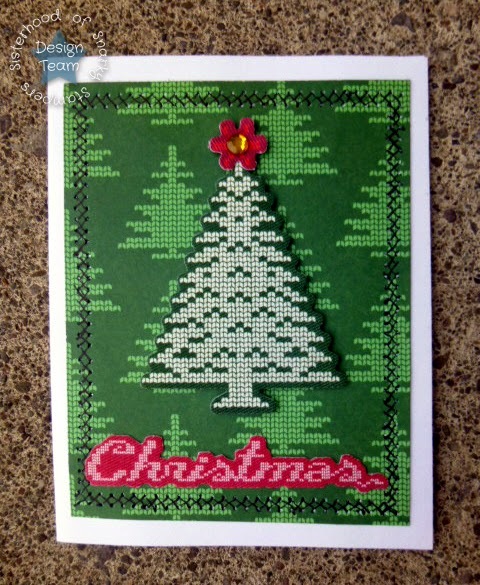 Here's what I came up with for the challenge, my card equivalent of an ugly Christmas sweater. I am not a fan of crafty things that look like cross stitch so I am not sure why I bought this particular design paper AND the embellishment packs that go with it....oh right...because it was cheap!!! I wanted to make my ugly Christmas sweater card even more hideous...so I added faux stitching all the way around the edges. Want to get in on the yucky fun?? 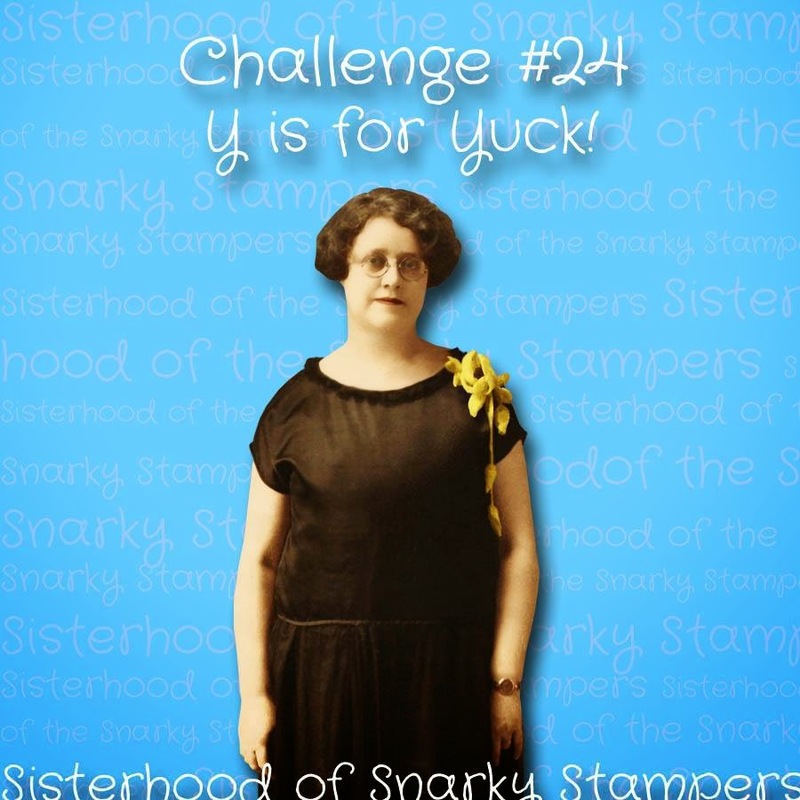 Upload your Y is for Yuck project to the SoSS BLOG by 11:55 pm (EST) on Friday January 9th. That card makes my eyes cloud over. I agree that paper is fugly. I used to be a cross-stitcher -- counted cross-stitch, even -- but had to give it up when my eyes couldn't see the symbols in the tiny squares. I think this is the greatest ugly sweater card, my Mom cross stitched until she was over 70, heck I got all her "stuff" and can't see me attempting it. Back to the card, love the faux stitching fabulous job. I about peed myself when I read the part about this being your card version of an ugly sweater! Buahahahahaha!! I did a boat load of cross stitching back in the day. This card is inspiring me to add some to a future card! LOL! Haha! My favorite thing is the title you gave your "ingredients" Yucky shite. Well I don't think this card is yucky all! It's super cute, to me. Have you seen my additional snot jokes yet ? Too funny! And haven't we all bought something questionable because it was cheap! I hear you on the cross stitch look, and yet you made it into a cute card! This card is hideous! Oh wait...it's mine...lol...I stand by my comment....YUCK! A fabulously fugly card! I love that you added more stitching to the overly stitched design. I don't get the attraction of the cross stitched look either but I'll bet I have some in my stash! This is the perfect Ugly Christmas Sweater Card! I love it! Maybe we should have Ugly Christmas Sweater cards as a challenge next year, although I'm not sure anyone could top yours! BTW, my house is filled with many questionable sale purchases. It is fugly. Good job of using this so it can move on! It does look like a ugly Christmas sweater. Great job and now you don't have it in your stash anymore. I thought I had commented earlier about just how horribly awful this is, and it is. Great ugly Christmas sweater look. definitely ugly Christmas sweater material! And dammit, why do we keep buying fugly stuff because it's cheap? AUGH!